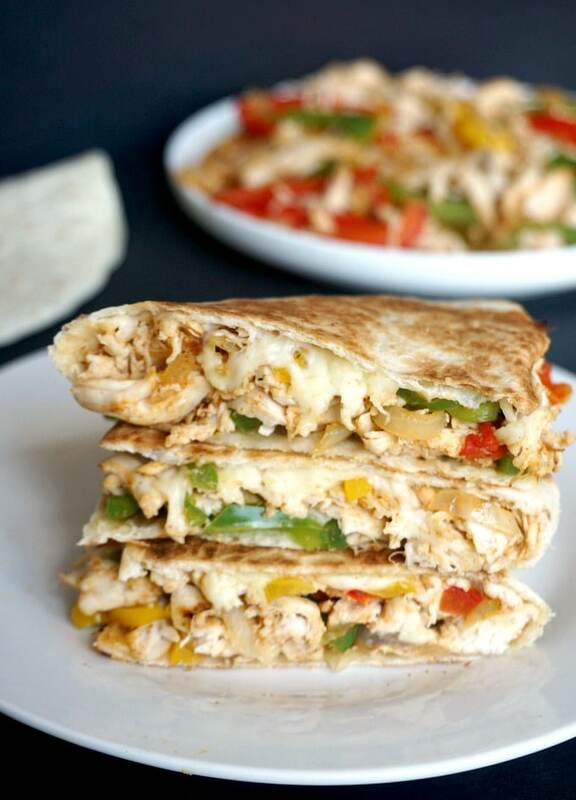 Chicken Fajita Quesadillas, a heavely delicious recipe that is officially children’s favourite food. Perfect as a back to school lunch idea for picky eaters, or a healthy dish to take out for picnics or playdates. 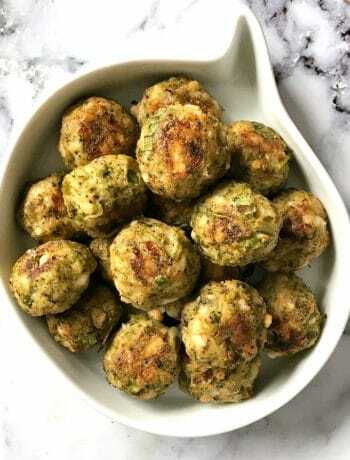 They are super easy to make, healthy and nutritious. Panicking already thinking what else to pack into your little one’s school lunch box? I know how it feels. I would hate to make the same boring sandwich every single day. And while schools/nurseries do not start until September, or even earlier in some places, time does fly, and a bit of planning in advance would not hurt at all. 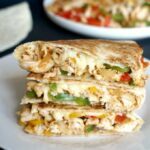 If you like the mexican chicken fajitas, but also like quesadillas, why not have the best of both worlds with these fabulous chicken fajita quesadillas. If you have leftover roast, even better, they will be ready in well under 10 minutes. Otherwise, you can cook the chicken breasts in any way you like, boiled and then shredded, grilled, roasted, whatever way is easier for you. I went for boiling this time, and it did not take long at all to cook. And not to worry about it being bland, it will get lots of flavour from the veggies and seasoning. Quesadillas are so versatile, and the choice of filling has no limit really. From vegan, to vegetarian or meat based, for any pockets, and any tummies, quesadillas are great for lunch, be it at school, office or on the go. And they are more delicious than any store-bought cold sandwich or mayo-drenched salad. If you don’t mind mess, you can get the kids to help preparing them. It does get messy, little hands don’t seem to care much about a tidy kitchen, do they? I do like when my little one gets excited about helping mummy, although I then have a lot more work cleaning afterwards, but oh well. And what’s the one thing that by magic makes everything taste like heaven? CHEESE, of course. Lots of yummy cheese. Stretchy, gooey cheese that I can never say no too. I used shredded mozzarella, but Cheddar or any other hard cheese would be good too. The cheese also helps keep the quesadillas together, so use as much as you like. Plus, kids usually like cheese, so you’ll definitely make them happy anyway. You can make these chicken fajita quesadillas without fajita seasoning, I like using granulated garlic and paprika, they bring so much flavour to any dish, and I use them together often. Or, if you are not keen on Mexican flavours, how about adding some pesto too, for a nice kick? Chicken and pesto work very well together. I know most kids liek pesto, so perhaps that’s something to experiment with. Tortilla wraps are great if you are after more school lunch ideas for fussy pickers, my Grilled Chicken Avocado Wrap always goes down a treat. Or, if they like avocadoes, how about Grilled Chicken Sandwich with Avocado? My little ones love them too. 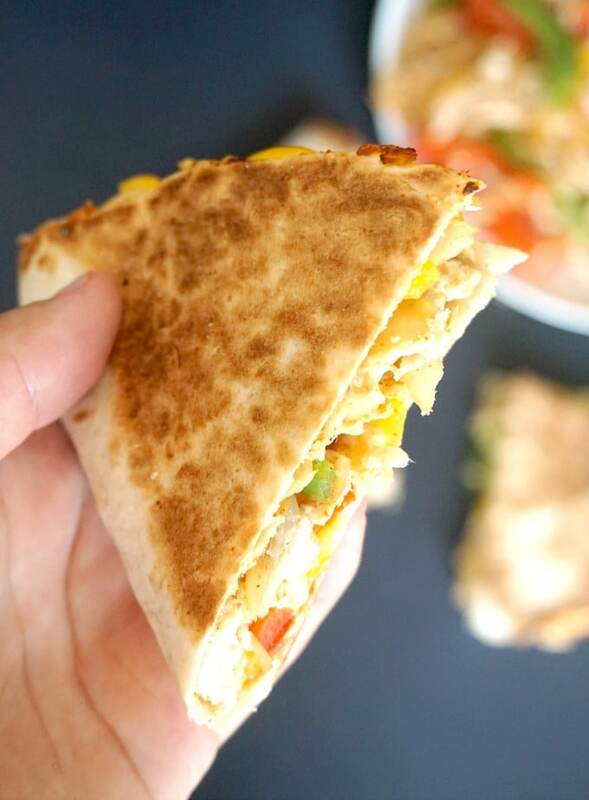 If you’ve tried this CHICKEN FAJITA QUESADILLAS or any other recipe on the blog then don’t forget to rate the recipe and let me know how you got on in the comments below, I love hearing from you! You can also FOLLOW ME on FACEBOOK, and PINTEREST to see more delicious food and what I’m getting up to. 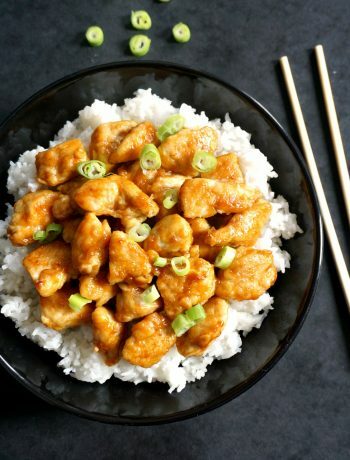 Looking for back to school lunch ideas for picky eaters? Kids will wolf down these Chicken Fajita Quessadillas and ask for seconds. Super easy to put together, healthy, full of flavour and simply delicious, my chicken quesadillas will be a big hit with the the grown-ups too. 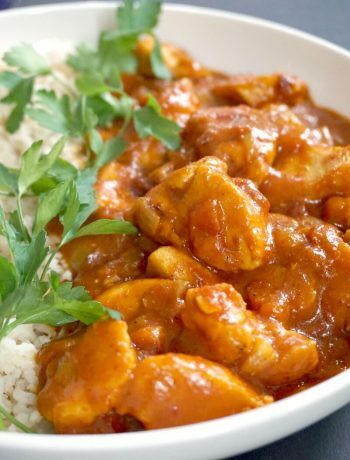 Boil the chicken breasts until cooked through, then use two fork to shred the chicken. Heat up the oil in a pan, then cut the onions and peppers into thin strips, and add them to the pan. Stir for 3-4 minutes until the vegetables are soft, then add the shredded chicken and fajita seasoning and mix well to combine. 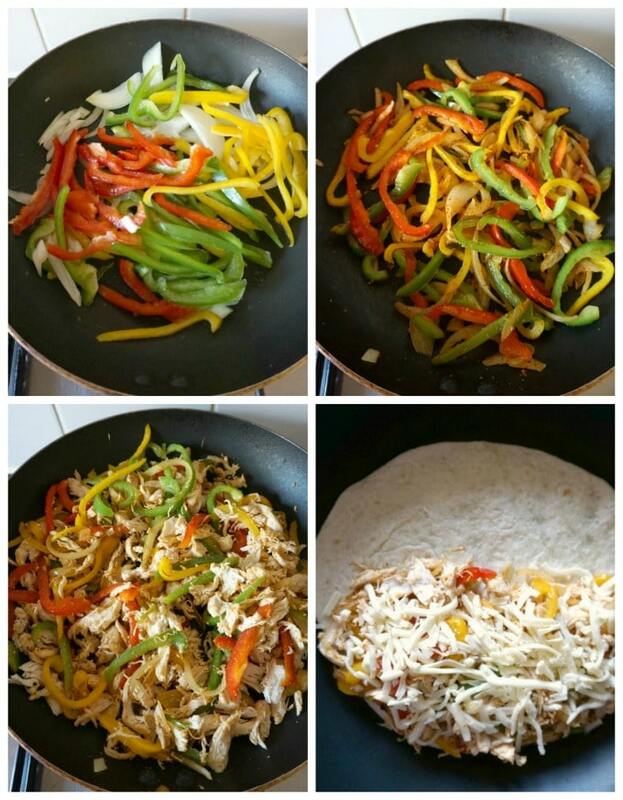 Take the pan off the heat, then transfer the chicken fajita to a plate. Wipe the pan clean, then add a tortilla wrap to the pan, and spoon some of the chicken fajita on half of the tortilla, and top with grated cheese. Fold the the other half of the tortilla over and cook on a low to medium heat for 2-3 minutes on each side until golden brown. Cut the quesadillas into 3, then repeat with the remaining ingredients.